Spreading through the Internet… a slightly modified photo of the infamous play that required deployment of New York riot police to restore order. 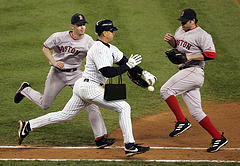 In Game 6 of Red Sox versus Yankees 2004, Yankee base runner Alex Rodriguez attempted to reach first safely by swatting the ball out of the out-stretched glove of the Red Sox pitcher. The first base umpire called ‘safe’ in part because his line of sight was blocked by the Red Sox first baseman, enabling another Yankee base runner to score. Sensing something amiss, the umpires huddled, corrected their mistake, called Rodriguez out for interference and brought the scoring runner back to first base. In the ensuing confusion, New York fans pelted the field with baseballs in protest and New York Police in riot gear were called onto the field to restore order. The Red Sox eventually prevailed in Game 6, to tie the series 3-3. The following day, they won Game 7 as well for the championship and became the first baseball team to come back in post-season play from an 0-3 deficit.